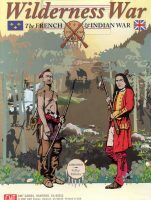 WILDERNESS WAR is a two-player game based on the French and Indian War—the climactic struggle between Britain and France for control of North America. One player is the British and the other is the French. 3RD EDITION RULES: The rulebook folds the “Advanced Rules” of previous editions into its main body and includes Optional Rules previously available only on line. Other minor edits and clarifications made for the 2nd or 3rd editions are indicated with a ~ symbol. No other rules have been changed. Wilderness War has been published in 2001, 2010, and 2015. 2015 is 3rd edition. The 2010 and 2015 Reprint versions include a MOUNTED mapboard. Add a Review for "Wilderness War (3rd ed.)"